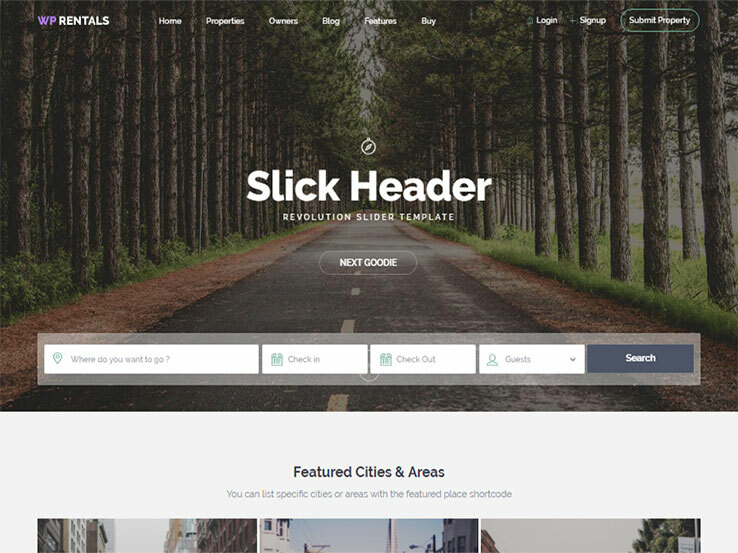 What’s a WordPress rental theme? It’s a template that allows you to rent items to customers of course! We see plenty of themes out there for selling products with WooCommerce, but what about solutions that let you share products with customers for a certain period of time? Cars, housing, and even video rentals could fit into this category, and it’s right on time, seeing as how so many of these sharing apps like AirBnB and Uber are popping up. 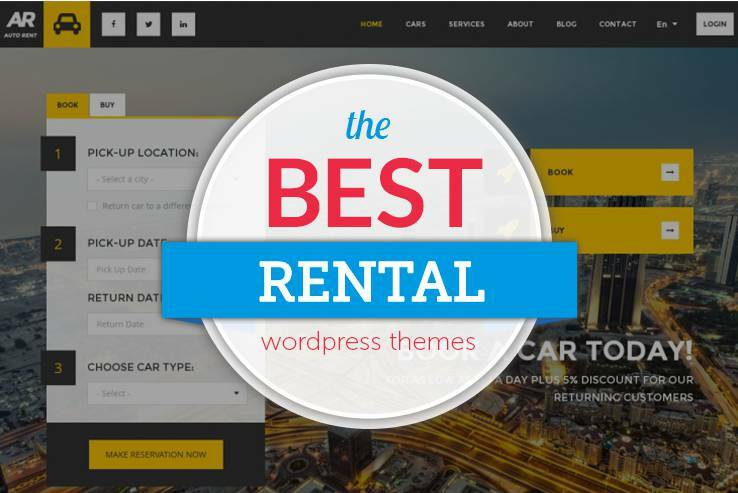 One of the most common forms of rental website is the auto rental platform, so many of the themes you see below are going to cater to that. However, we also have a few that are more generic in nature. For example, if you’d like to figure out a way to rent your bike to the neighborhood, more power to you! Chances are it won’t make much money, but you could eventually turn this into a full-fledged business where you’re renting out several bikes to tourists. You never know! The booking module or page is the most important part of a rental theme, since there’s really no reason to go out and buy one of unless it lets your customers rent from you. We also like seeing regular eCommerce tools like discounts and product detail grids. Connecting to a payment gateway is essential, and you’re most likely going to need to integrate with WooCommerce to make the whole checkout process happen. Who Needs a Rental Theme? The main business that comes to mind when considering rental themes is the car rental industry. Another is home rentals, similar to AirBnB. However, there are many forms of transportation, so like we talked about in the introduction, you could generate a website for a bike rental business, trolley, horse carriage ride,s or even a pedicab business that you run near the ballpark. I’ve even seen websites for parking during big games, all funneled through a rental-style website. You have full permission to get creative here. We’ve compiled the best from around the web. Please leave us your thoughts in the comment section if you think we’ve missed any themes that should be on this roundup. 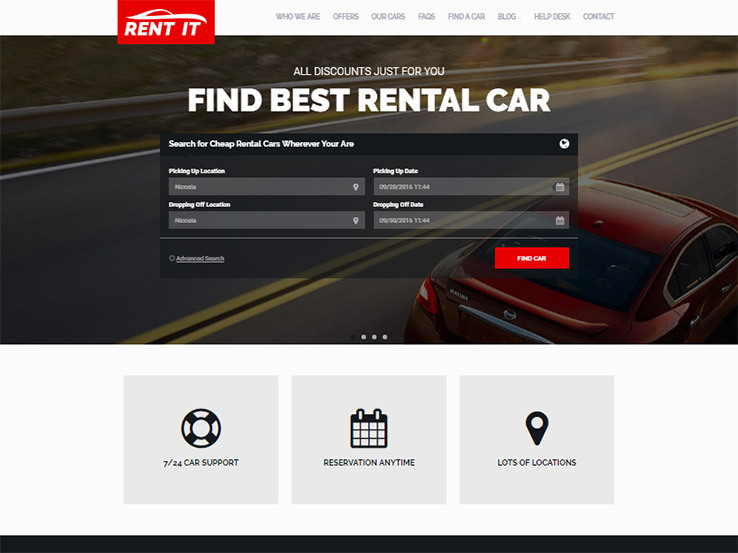 The Rentit theme is the quintessential solution for car rental services. 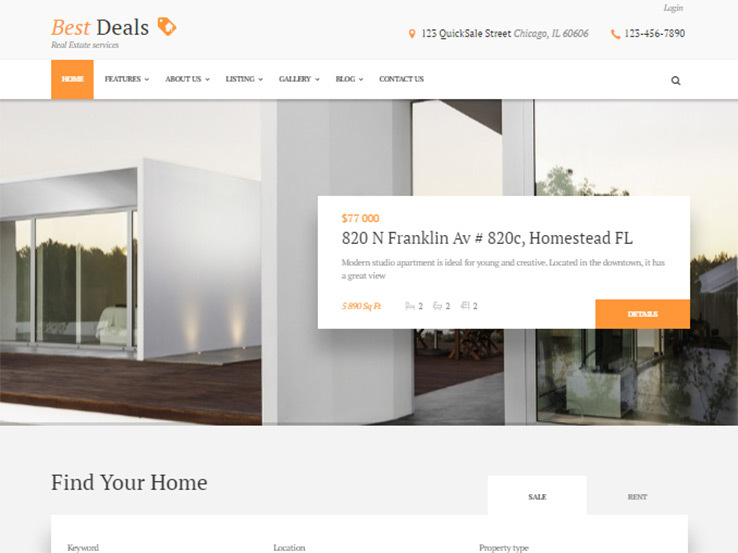 It has a sleek and modern layout, and you get eCommerce capabilities like discounts and seasonal specials. The five homepage variations are enough to differentiate your business, while the booking page is perfect for collecting information from customers. 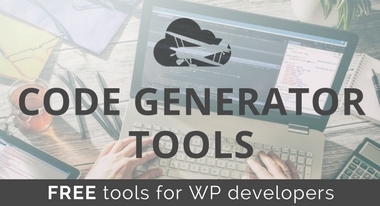 The drag and drop page builder is packaged into this theme for free, so you gain access to visual modules instead of having to mess with the coding. The four car listing views include grid, list, full-width grid, and a full-width list, and the car booking process is all done through the WooCommerce plugin. Multiple colors are included with the Rentit theme, and you get search filters for guiding users around. Integrate with multiple payment gateways, and use the one click demo installation to speed up the development process. Other features include easy to add locations, car portfolio pages, shortcodes, Google Maps, Google Fonts, a Facebook login, and MailChimp integration. 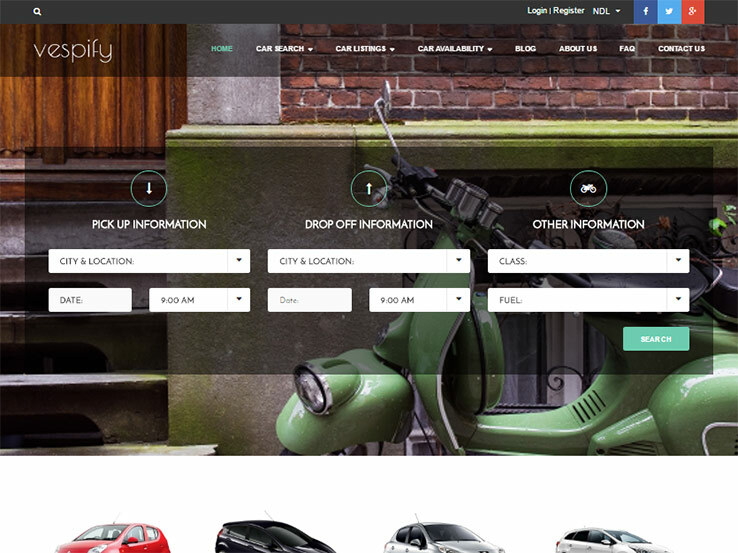 The Rentify theme is yet another car rental solution. Keep in mind that the theme requires the Car Rental System plugin, but it’s sold separately. Once you combine the theme with that plugin, you can reveal a beautiful booking system, with pick up and drop off information. 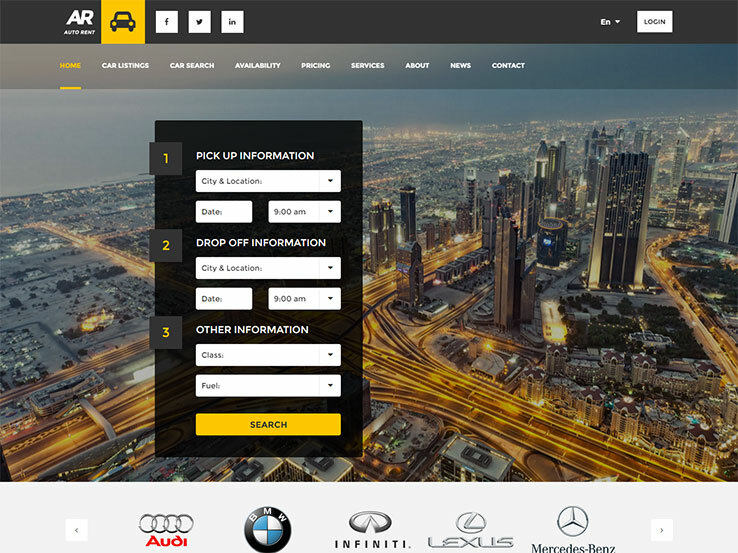 The theme has a completely responsive layout for mobile devices, and it provides a stunning collection of car listing pages for you to adjust. The Visual Composer plugin is packaged in with your purchase, meaning that you don’t have to be a coding expert to make a professional site. Share unlimited cars, features, and extras on the car pages, and integrate with PayPal or your own payment gateway. Confirmation emails are sent out to customers, and you can include an invoice with each one. The multilingual support is a bonus, while the fancy car slider combines well with the pricing table. The stunning design has the booking module right in the header, and the automated confirmation emails keep you and the customer on the same page. The DGbooking and NGfilter plugins are both included when you buy the Auto Rent theme, and you can feature all of your cars in a grid-based portfolio, with pictures, pricing, and more. The modern design has Google Maps support, and a ratings and reviews system is there to help people decide on the cars they want. Estore is not exactly made for rentals, but there’s no reason you can’t make it do the job. The plugins that integrate with the theme include Simple PayPal Shopping Cart and eShop. The complete localization helps out when trying to expand your business and the five different colors get you started in the right branding direction. Shortcodes come along with the Estore theme. So, if you’d like to insert a button or box, you don’t have to know anything about code to make that happen. 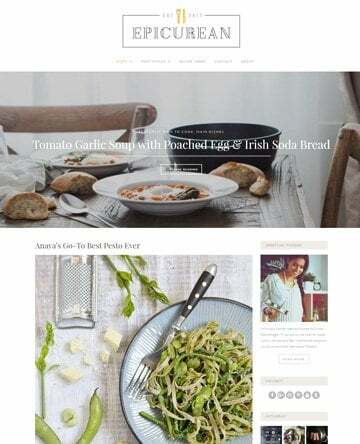 Some unique page templates are provided, such as galleries, contact, and blogs. Not to mention, you receive a slider for featuring the most popular rental items. 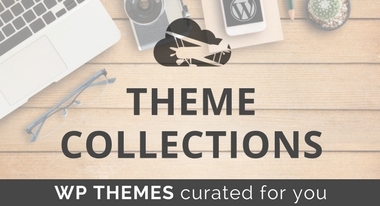 What’s cool about this theme is that you can use it to rent just about any type of product. All of these products are displayed in widgets on the homepage. The widgets show featured products, deals of the day, company info, and recent products. 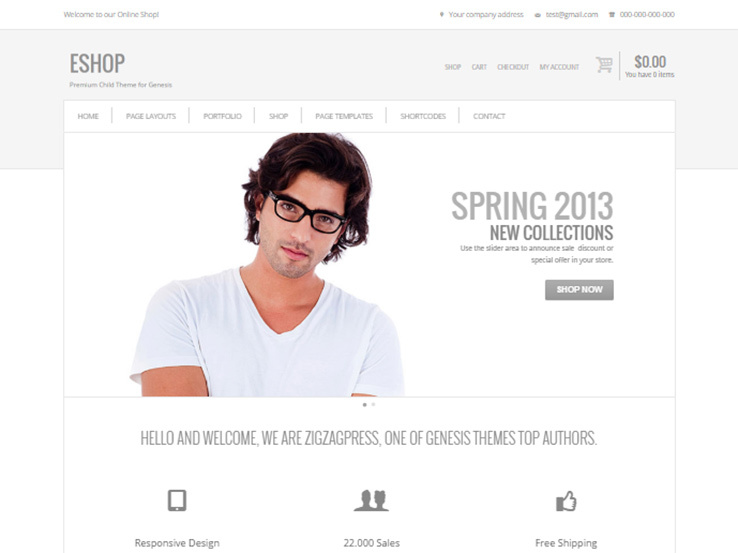 Eshop is from ZigZagPress, so you know already it’s going to have a clean and minimalist design. Localization is provided, and the clean coding is sure to keep your site running smoothly. Feel free to integrate with the wide variety of eCommerce plugins, but we would recommend going with WooCommerce. A few widgets come along with the theme, too, like Flickr, Twitter, and one for recent blog posts. Share your rentable products through widgets on the homepage using collections like sale products and featured products. The main reason we like this theme is because it’s filled with shortcodes for making your life easier. For example, they give you one for WooCommerce, along with shortcodes for testimonials, clients, calls to action, and buttons. Along with page templates, a portfolio, and a beautiful contact form, the Eshop theme serves as a viable choice for your rental business. The WPRentals theme is a refreshing deviation from all of these car rental options we’ve been looking at. This one is more like AirBnB, with support for those who would like to rent out housing. It lets you establish a website that helps users discover and rent new places from around the world. Setting custom prices is done on the dashboard and discount pricing is available for when people book for longer periods. People renting their homes can manage a calendar from their own profiles, and the multi-currency functionality is sure to bring in users from all over the globe. A new feature includes wire transfer support for payments and you can integrate with the WP Rentals plugin to make your bookings easier. Listing properties in specific cities is done through the advanced Google Maps tool. 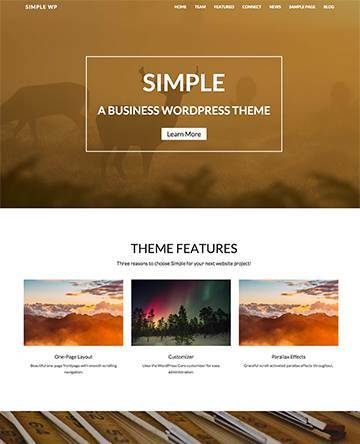 Along with the included Visual Composer and Slider Revolution plugins, this theme packs in a lot for the price. The Best Deals theme is yet another property rental choice. The minimal design combines well with the clean typography, and the SEO and social engagement elements are sure to improve the number of users that come to your site. The custom shortcodes include options for accordions, buttons, columns, Google Maps, highlights, and sections. You’ll also find some widgets for popular posts, recent posts, top 10 lists, logos, social icons, and more. The plugin integrations are powerful, with support for Swiper Slider, Revolution Slider, Visual Composer, Essential Grid, and PO Composer. The user menu helps people out, and you also get main menu support. The main menu slider draws in attention, especially with the awesome CSS3 and jQuery animations. The cool, vintage design has both boxed and full-width layouts available. 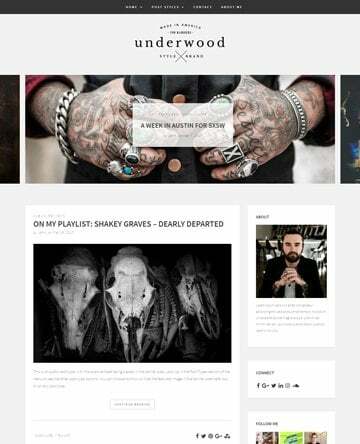 Not to mention, the different header styles are complemented by beautiful hover effects. This is another excellent choice. 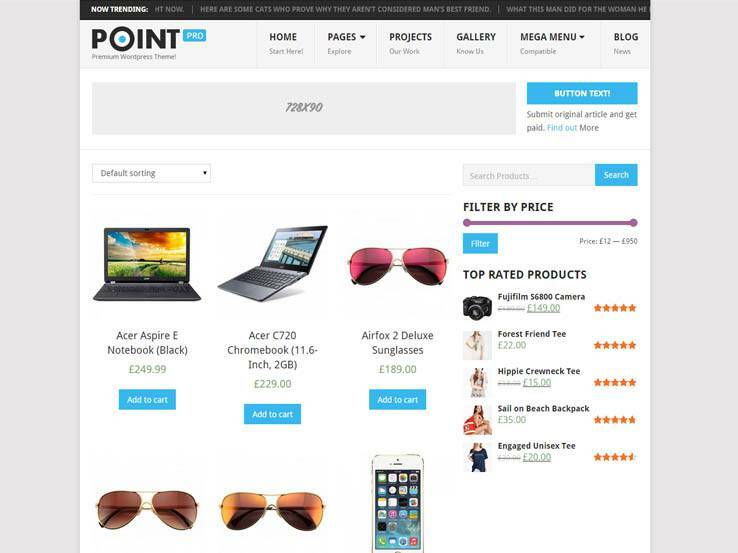 The PointPro WordPress theme is a simple eCommerce template, and it includes an intuitive layout with drag and drop capabilities. The theme comes with a responsive design and translation files and you can use the custom widgets for organizing your content. The slider section can work for any rentals company, and the features section is a good way to explain your services in more detail. The projects section is probably not going to be utilized by a rentals business, but it could be used for showcasing cars or rooms. 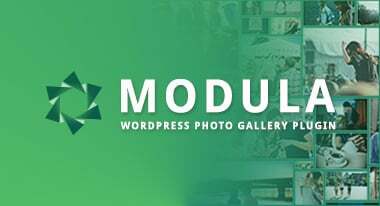 The theme does support WooCommerce, and you can implement galleries, category sections, and team member profiles. 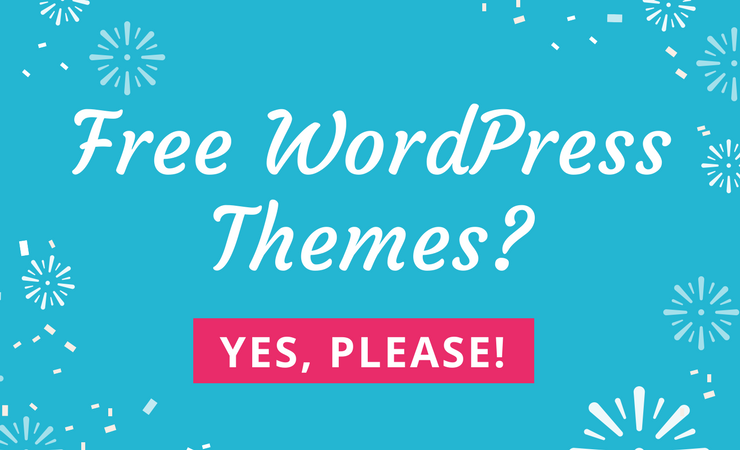 Along with custom sidebars, unlimited colors, unlimited backgrounds, and WP Mega Menu plugin integration, the PointPro theme delivers on many levels. 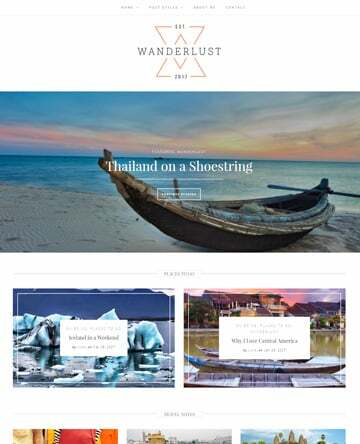 Hi, Can you recommend any wordpress themes similar to stuff rentals that have just wishlist product/ not e-store? Hi Heather,\n That is an excellent question. I wasn’t able to locate a specific theme with just this function, but there is a plugin called Favorites you might want to check out. This plugin would allow you to add the wishlist function to your site. Hope this helps :)\n \nDoes anyone else have a better solution for Heather? We would love to hear about it. Can you recommend a wordpress rental template that might work for a small video equipment rental business? I have looked around but most rental templates for cars and accommodations don’t fit quite right with what I am looking for. What features are you looking for your site?